Demonstrate practical training and theoretical knowledge of renewable real estate and development. Pursuing MBA in sustainable management at the Presidio Graduate School, recognized as a leading program in sustainable studies. Utilize a green approach to land selection, acquisition, and development with a focus on resilience, sustainability, and economic prosperity. 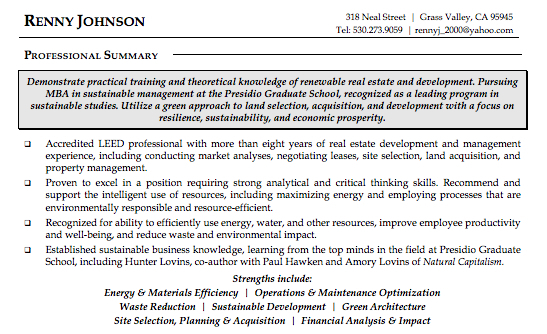 Accredited LEED professional with more than eight years of real estate development and management experience, including conducting market analyses, negotiating leases, site selection, land acquisition, and property management. Proven to excel in a position requiring strong analytical and critical thinking skills. Recommend and support the intelligent use of resources, including maximizing energy and employing processes that are environmentally responsible and resource-efficient. Recognized for ability to efficiently use energy, water, and other resources, improve employee productivity and well-being, and reduce waste and environmental impact. Established sustainable business knowledge, learning from the top minds in the field at Presidio Graduate School, including Hunter Lovins, co-author with Paul Hawken and Amory Lovins of Natural Capitalism. Personal Project: SignPost Projects, Inc. - Co-authored cycling guidebook: Northern Sierra Nevada Road Bike Rides. Book showcases road cycling routes and corresponding maps of the Northern Sierra Foothills. 500 copies sold to date. Second edition in progress. Book featured in more than 15 retail outlets. Leverage understanding of ecological and economic principles to offer guidance and advice for a start-up modular construction operation focused on sustainability and development. Collaborated with construction managers and consulted with the company's internal financial resources to meet construction funding requirements for the Walgreens Company. Explored opportunities in various municipalities; worked with brokers to identify available lots. 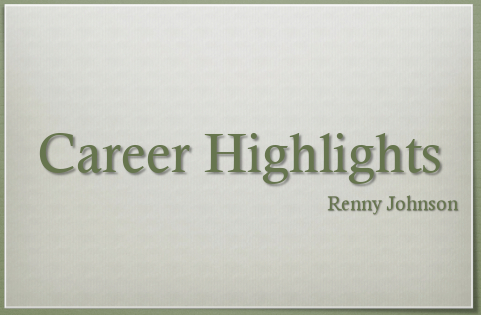 Maintained ongoing knowledge of trends and competitive position in the California real estate market. Developed and maintained relationships with real estate owners, brokers and developers to identify ideal store sites in targeted markets. Defined market and expansion strategies, identified potential sites, led deal negotiations, and handled asset management and dispositions. Collaborated with internal and external construction, design, market research, finance, legal, and operations partners. Managed multi-million dollar budgets to complete store openings and various expansion plans. Completed 22 deals and 30+ renewals. Managed operations for various industrial, flexible, medical, office, and retail properties with 500,000+ sq. ft. of space. Led and directed efforts of managers, engineers, maintenance crews and support staff; oversaw a $200,000 annual budget. Served as the key point of contact for sub contractors, including landscapers, carpenters, electricians, and HVAC technicians, among others. Renegotiated lease deals and resolved tenant issues. Monitored buildings' performance, including environmental impact. Evaluated opportunities to reduce costs and maximize resources with a focus on sustainability. Conducted an annual review of operating budgets and P&L statements for 15 buildings on the portfolio. Reduced costs between 5% and 10% year over year through effective planning and operating revisions. Drove 20% improvement in tenant retention. Created a web-based work order system to address maintenance issues. Oversaw all renovation work. Inspected properties on a daily basis, ensuring adherence to health and safety conditions.